Every inbound call to any number is routed using the call flow assigned to that number. Select a phone number. If you don't have any phone numbers available you need to click Buy Number first. Set the flow to ACTIVE. All actions are described below. Select which queue the incoming calls should go to. Select which language the "number in queue" messages should be in. Danish, Dutch, English (UK), English (US), French, German, Japanese, Norwegian, Portuguese, Romanian, Russian, Swedish Spanish, and Turkish are supported. Please contact Dixa if you require support for any of these languages: Dutch, French, Icelandic, Italian, Japanese, Korean, Polish, Romanian, Russian, Turkish and Welsh. You can disable the number in queue message that is announced every 30 seconds or set a limit for the highest number in queue that will be announced. If this is enabled, customers who are above this number in the queue will hear an announcement saying: "we are experiencing a large number of calls at the moment. Please hold." in the selected language. If you want to enable a queue timeout select enable under Timeout. This will trigger a new action in the call flow after a certain time that you set yourself. You should make sure that at least one agent is assigned to the queue. Otherwise, no one will receive the conversation offers. You are able to do this under Settings -> Queues. Have calls forwarded to one or more external phone numbers. Rearrange the ring order by dragging the numbers up or down in the list. All numbers are called at the same time and the first to pick up the phone gets the call. The first number on the list is called and if the call is not answered, then the second, and so on. No timeout, or between 5 seconds and 4 minutes. If the conversation is not answered and a timeout has been set, you can choose a new action the the call flow. Start by entering the timezone for the incoming phone number. Set opening hours for each day of the week. We're currently working on adding a calendar function that will allow you to plan opening hours further ahead in time. Upload or record an announcement for the Interactive Voice Response (IVR). Beware that this announcement should go through what the callers' options are (for example: "Please press 1 for sales and 2 for support"). Select the number of options you want under MENU. All conversations after this action in the call flow will be recorded and made available to listen to in the conversation view. You can activate call recording at the very start of your call flow or later in the call flow depending on whether you want to record all or only some conversations. The recordings will be added to the conversation after it's over and are available for all team members. Beware that explicitly stating that the conversation is being recorded is required by law in certain countries. Upload or record an announcement in an mp3 format. Select if the call should go to a new action or be disconnected after the announcement has been played. First, in this call flow, the flow checks to see if the call is happening within opening hours. 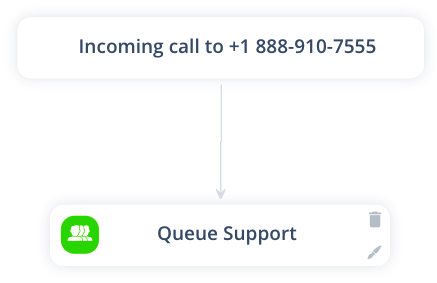 If the call is occurring during opening hours it is sent to a queue named Support, otherwise it is sent to voicemail. Voicemails are offered to the available team member, typically the morning after. 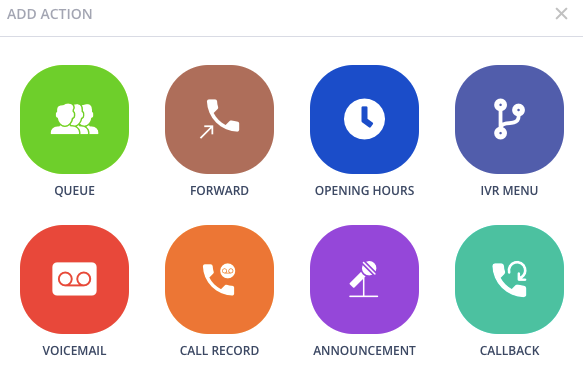 In this more advanced call flow, calls are also checked against opening hours first. If the call happens within opening hours it's sent to a an IVR menu where the customer has to select 1, 2 or 3. Pressing 1 sends the caller to a queue named Sales, 2 goes to a queue named Support and 3 is forwarded to an external phone number. 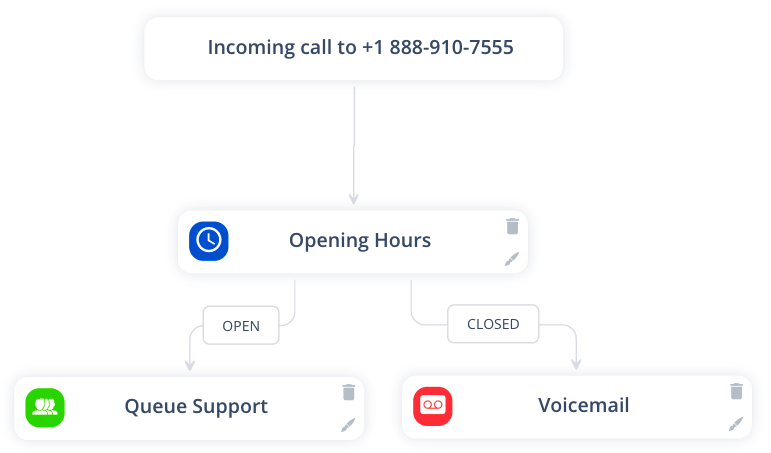 The most basic call flow - incoming calls are always routed directly to a queue named Support. While customers are waiting in a queue, music will be played. Every 30 seconds an announcement with the customer's queue position is played. 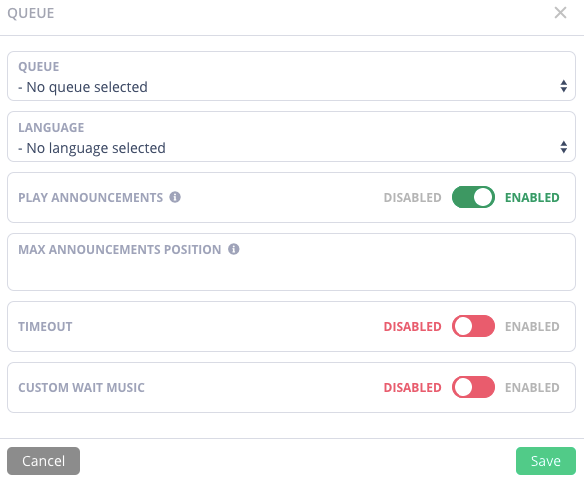 The language for the queue position can Danish, Dutch, English (GB), English (US), French, German, Norwegian, Portuguese, Spanish and Swedish.